Age of Empires Online, Microsoft's attempt to take the popular RTS franchise into the online, free to play space, has been shut down. The servers were permanently shut down on July 1, 2014. AOEO launched in August of 2011, with its first two civilizations, the Greeks and Egyptians. Over the years, Persians, the Celts, the Babylonians and the Norse were added. In the summer of 2012 the developers changed the basic model of the game itself, allowing players to earn Empire Points and play their way to owning more civilizations and vanity items, and adding shifting Alliances to give high-level Empires more reasons to make wars upon each other. However, by January 2013 it was announced that the game's development has been stopped. And now, a year and a half later, it has been shut down. 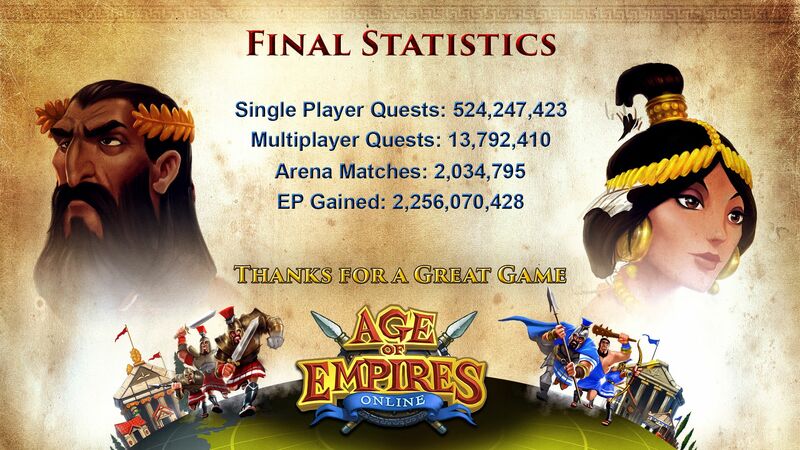 Some final player stats have been revealed, as seen in the image below.